New observations by NASA's OSIRIS-REx spacecraft suggest that the 1,650-foot-wide (500 meters) Bennu harbors lots of accessible water, a key resource that prospective asteroid miners aim to target. OSIRIS-REx is making valuable observations from Bennu orbit, but much of the mission's science data will be gathered here on Earth. If all goes according to plan, the probe will snag a sample of Bennu material in July 2020, then deliver that stuff to Earth in a special return capsule arriving in September 2023. The main goal of the mission is to learn more about the solar system's early days and to better understand the role that dark, carbon-rich asteroids such as Bennu may have played in life's emergence on Earth. That role is suspected to be significant; scientists think asteroids may have delivered much of our planet's water, as well as lots of complex organic molecules — the building blocks of life as we know it. This image of the asteroid Bennu shows a view from NASA's OSIRIS-REx spacecraft (left) and a spectrum analysis of its composition. The new results, which Lauretta and his colleagues announced today (March 19), confirm and extend that recent discovery: OSIRIS-REx has now spotted the apparent signature of the iron-oxide mineral magnetite on Bennu's surface. A candidate sample site on asteroid Bennu for NASA's OSIRIS-REx spacecraft. He and the mission team haven't yet nailed down the origin of this activity. But the leading theory holds that Bennu's parent asteroid formed far away from the newborn sun, incorporating significant amounts of water ice and organics, along with rocky and metallic material. Some radioactive elements, such as aluminum-26, got sucked up as well, and the heat thrown off by this stuff likely melted lots of that native ice. This likely happened very early on, he added — within the first 10 million years or so of the solar system's existence. To be clear: The water we're talking about on present-day Bennu isn't stand-alone and pure; it's locked up in those clays, in the form of hydroxyl groups (one oxygen atom and one hydrogen atom bonded together). But it is likely accessible: Hydroxyl can be baked out of clays, generating water vapor, asteroid-mining advocates say. For example, OSIRIS-REx's observations suggest that Bennu's rotation rate is speeding up, likely because of the reradiation of solar energy as heat — something known as the Yarkovsky-O'Keefe-Radzievskii-Paddack (YORP) effect. It currently takes Bennu about 4.3 hours to complete one rotation; if this spin speedup continues apace, that rotational period will be cut in half in 1.5 million years, Lauretta said. The team also determined Bennu's bulk density to be about 72.3 lbs. per cubic foot (1,190 kilograms per cubic meter) and the asteroid's interior to be about 50 percent open space. Both of these numbers indicate that Bennu is a rubble pile rather than a solid block of rock, the scientists said. 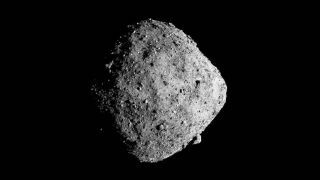 The abundance of visible craters may force a rethink about how asteroids such as Bennu and Ryugu, which Japan's Hayabusa2 spacecraft is currently studying up close, got their striking diamond shapes. The leading explanation posits that this shape results from a fast spin, which causes loose asteroid material to migrate to equatorial regions. But such migration would be expected to bury many craters, so perhaps something else is going on. "We're actively re-evaluating that model," Lauretta said. And in a real shocker, OSIRIS-REx observed particles streaming from Bennu's surface multiple times in January and February, meaning the space rock is one of just a dozen or so known "active asteroids." It's unclear what's causing this activity, but the team is keen to investigate it, Lauretta said. Bennu's surface diversity also manifests as rocky ruggedness, which has surprised the mission team. Radar imagery by big, ground-based dishes such as the Arecibo Observatory in Puerto Rico had revealed just one boulder with a width of between 33 feet and 66 feet (10 to 20 meters). Those data, and the suspected spin-induced equatorial migration of material, gave the OSIRIS-REx researchers reason to think Bennu is pretty smooth, at least at low latitudes. That's an issue, because the mission design calls for OSIRIS-REx to grab a sample from a boulder-free patch at least 165 feet (50 m) in diameter. Lauretta said he's confident the team will make everything work, though sample collection may have to be pushed back a bit as a result. But the team has some leeway; the sampling operation can be performed as late as October 2020 with no significant effect on the mission timeline, Lauretta added. The OSIRIS-REx team takes heart from the success of Hayabusa2, which grabbed samples from rugged Ryugu last month. And Lauretta and some colleagues will travel to Japan in April to get information and advice from Hayabusa2 team members, especially about how Ryugu's surface behaved during the sampling sortie, he said. "That's still our biggest uncertainty — what is the nature of this material in the microgravity environment?" Lauretta said. "What forces are holding it together, and how does it respond when a spacecraft punches it in and then fires thrusters to back away from it?" The Hayabusa2 team, by the way, unveiled a raft of new results today, as well, in three papers in the journal Science and at LPSC. The Japanese mission has determined that the 3,000-foot-wide (900 m) Ryugu is likely relatively dry, though it's carbon-rich and diamond-shaped like Bennu. The new OSIRIS-REx results come from observations made during the probe's approach to Bennu last summer and fall, and its early days orbiting the space rock. There's a lot more to come, as the science team analyzes more-detailed data and imagery. For example, OSIRIS-REx hasn't confirmed the presence of organics on Bennu's surface, but the probe hasn't really had a chance to look yet. The observations that may do the trick will be performed seven or eight weeks from now, if all goes according to plan, Lauretta said. "The science is really starting to ramp up," he said. "You haven't seen anything yet." And we may have to wait a few years for the most exciting results. Hayabusa2's sample is scheduled to land on Earth in December 2020, and OSIRIS-REx's won't touch down until nearly three years later. "That's really exciting," Lauretta said. "You can learn a lot by bringing a sample back from an asteroid, but we're going to learn exponentially more by bringing samples back from these two asteroids, which initially looked very similar to each other, may still be related to each other but have had different histories."